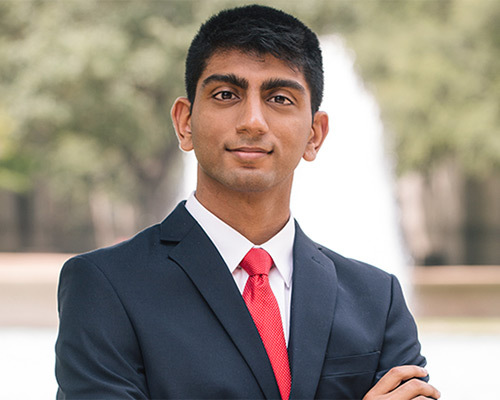 Neelesh Mutyala, Honors Biomedical Sciences student in the College of Natural Sciences and Mathematics (NSM), has been selected as student regent for the University of Houston System Board of Regents. During his one-year term, he will have all of the duties and responsibilities of a board member except for voting and quorum privileges. The Board of Regents, which is composed of nine regular members, as well as a student regent, is the governing body for the University of Houston System. Decisions made by the Board of Regents act to establish university priorities and initiatives. Mutyala, who is from Sugar Land, Texas, is part of UH’s accelerated 3/4 B.S./M.D. program, which guarantees acceptance to either the University of Texas’s McGovern Medical School in Houston or the University of Texas Medical Branch in Galveston. Scheduled to enter medical school in fall 2018, Mutyala will spend his final year at UH giving back in his capacity as student regent. Selection for student regent was rigorous, with each campus Student Government Association selecting five candidates. These 20 candidates were then interviewed by vice chancellors on behalf of Chancellor Renu Khator. After this interview process, select candidates were interviewed by the Texas governor’s office, with the final appointment for student regent signed off on by Governor Greg Abbott. Mutyala became interested in serving as student regent as a result of his interest in higher education systems. He developed this interest while fulfilling requirements for an education minor in the teachHOUSTON program, which is a partnership between NSM and the College of Education that gives NSM majors the opportunity to graduate with a teaching certificate. Mutyala succeeds Joshua Freed, who served as student regent during the 2016–17 academic year, and will become the 12th Student Regent to serve the UHS Board. His term runs through May 31, 2018.